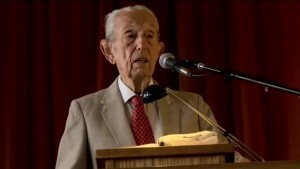 ALAMEDA, Calif. — Harold Camping, the California-based radio broadcaster known for his attempts to pinpoint the exact date of Judgment Day, died on Sunday. He was 92. According to his ministry, Family Radio, Camping died at his home in Alameda following an accident involving a fall. Camping has been known over the last 40 years for his multiple predictions regarding the end of the world. He first predicted in the 1970’s that Judgment Day would occur on May 21, 1988. When the date passed without the return of Christ, Camping later went on to write a book that speculated that the event could occur sometime during the year 1994. When the day again passed, Camping stated that he believed a “spiritual” judgment had occurred and that the rapture would take place on October 21st of that year. However, many then labeled the radio broadcaster a false prophet, and a drop in donations coupled with expenditures from advertising campaigns forced Camping to sell some of his radio stations. In March 2012, Camping released a letter repenting of his predictions, remarking that it was “sinful” of him to attempt to prognosticate the time of God’s judgment, and asked for forgiveness. The radio broadcaster, who owned nearly 60 stations and 39 translators, did not make any further predictions since issuing the letter. Camping suffered a stroke in 2011 that left him hospitalized and in a nursing home for a time. Two weeks ago, he was injured in a fall from which he never recovered. He died on Sunday at his home in California at approximately 5:30 p.m. Camping leaves behind a wife of 71 years, Shirley, and seven children. Family Radio will continue in his absence.